My new Japanese obsession (this week) is Gegege no Kitaro. This is an anime based on a classic manga created by Shigeru Mizuki, and the cartoon has gone thru various versions from the late 60s, to a recent one in the 2000s. It’s about a yokai boy (Japanese monsters of folklore: sometimes translated as “goblins”), and his father (who is an eyeball with a tiny body beneath it) who solve mysteries involving other yokai. There is a cast of reoccurring side characters, the main one being a con man like guy named “Rat Man” who apparently stinks like hell. There are other yokai that help Kitaro out, from a sand throwing old lady- “Sunakake Babaa”, a creepy crying old man- “Konaki Jijii” a floating parchment- “Ittan Momen”, to a plaster wall – “Nurikabe”, among others. Anyone, (I’m talking to you Joanie) that loves Nightmare Before Christmas, would probably love this show. The entertaining things about it aren’t just the various creatures based in Japanese folklore (snow women, kappas, etc…), but also the catchy theme song that is an ear worm. It’s a great example of how public tastes change, where the original 60s version is straight forward, while the 80s is a synth heavy one, but are all just, well,… fun. The most recent version is more in line with the original comic, sort of like EC’s Tales of the Crypt (and the Cryptkeeper); so horror mixed with a bit of humor. This latest one tries to separate itself from the previous shows by dropping the classic theme for a whacky house music take, and Kitaro’s design is more in line with the original comic. Anyway, here are some sketches based on the older cartoons. Seriously, check it out on youtube, or other outlets. Sadly, I don’t know of any dubbed versions, and the subtitled ones are all Japanese imports, or fansubs. Here’s Kitaro and his father ,Medama-Oyaji, and the infamous “Rat Man” Nezumi Otoko. 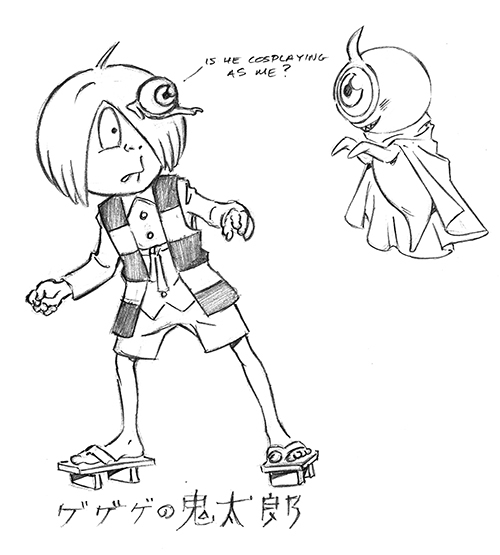 Gegege no Kitaro must have had some sort of influence on the Kamen Rider tv show, because there are obvious similarities between the ghost-eye mascot, while even the main character, Takeru Tenkūji, has hints to Kitaro’s costume. 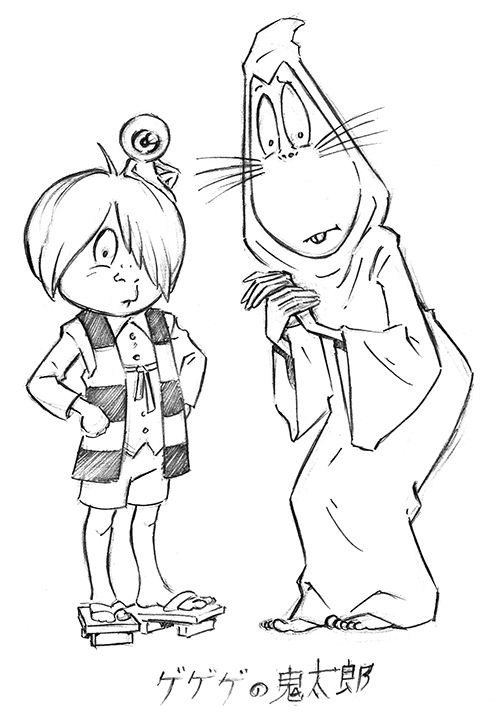 Here’s Kitaro, and his father, meeting Yurusen from Kamen Rider Ghost. FYI- the kanji script beneath the drawings is just the title of the show, and part of my (extremely flawed) attempts to learn Japanese.